Whether you are marching off to battle or simply favor an armoured look for your LARP character, the Soldiers Belt Shield is a staple addition to any warriors outfit. This plate armour piece attaches to belts with wide leather straps. Made of 19 gauge steel, the belt shield is decorated with rivets. The belt shield is sold as a single piece, but it easily fits onto most belts and looks great when paired up with another belt shield, as shown. 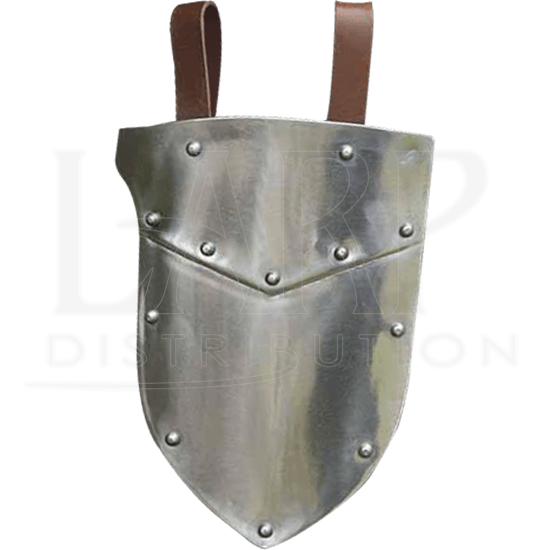 Add authenticity and an extra level of protection to any medieval or fantasy look with this steel armour belt shield!